The heat of the outdoor grill or your indoor broiler, brown and sweeten these best-bets from the summer garden in this unbelievably easy and unforgettably delicious salad. 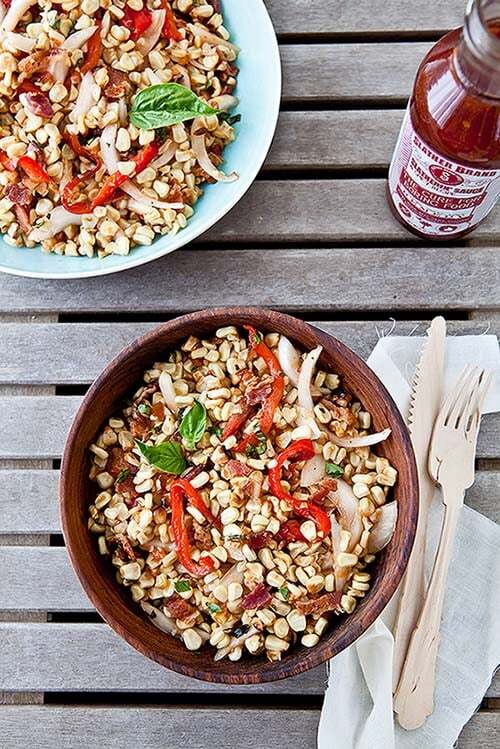 Spice Slatherin’ Sauce gives the corn just the right kick, which is tempered with the peppery, sweet bite of fresh basil. This is the perfect salad to pair with barbecued anything and can be prepared all summer long. Pre-heat your broiler to high or your gas/fire grill to medium high heat. Prep the corn, onion, and red bell pepper as directed. Brush each lightly with the olive oil and arrange in a single layer either in a baking sheet for the broiler or directly on the gas/fire grill, over the hottest part of the flame. Rotate and turn the corn, pepper and onion to char/cook evenly. Meanwhile, cook off the bacon in a sauté pan over medium high heat until crisp. Drain on paper towels. Remove the vegetables from the grill or broiler when tender and slightly charred – about 5 minutes. Allow to cool.